Though spine surgery has advanced greatly in the last decade, even endoscopic and minimally invasive spine surgeries can be major operations. That’s why it’s important that you carefully consider if surgery is the right treatment for your back pain before you commit to an operation. Do you have a specific diagnosed problem? Spine surgery is more effective if your surgeon can identify the specific cause of your problem. Just because there is a bulging disc on your MRI doesn’t necessarily mean that it’s the cause of your pain. In fact, an MRI on its own does not show “pain.” You may have other conditions, like spinal stenosis or arthritis, that are the actual causes of your back pain. An MRI must always be interpreted in the context of your symptoms and examination. 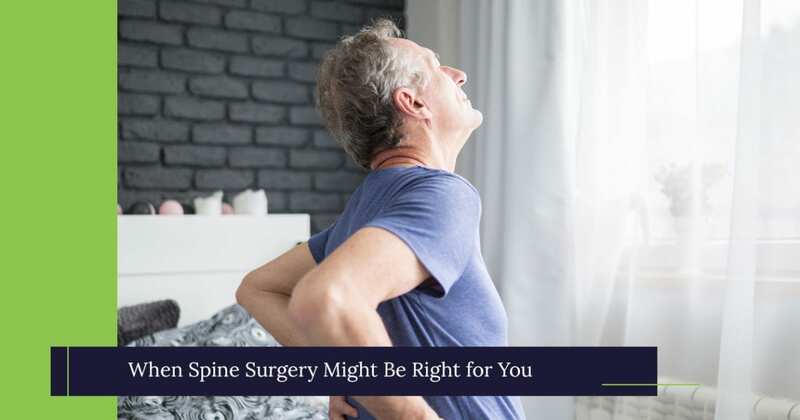 That’s why Faisal Siddiqui, MD, spine surgeon at The Spine Care Center, always corroborates your pain symptoms with MRI results and other advanced imaging tests. Before surgery, Dr. Siddiqui always ensures the procedure will address the right problem and provide lasting pain relief. Dr. Siddiqui is focused on positive outcomes for all of his patients. If it’s not clear what is causing your back pain, then you may want to consider getting a second opinion or trying other treatment options first. An operation without a careful and accurate diagnosis may reduce your chances of finding complete and lasting back pain relief. Have you tried more conservative back pain treatments? Surgery should be a last resort to relieve back pain in most cases. You should always try other treatments with fewer risks, like steroid injections, first. Some studies even show that using these treatments can provide long-term relief and help you avoid spine surgery. At The Spine Care Center, our interventional pain management experts help more than 90 percent of our patients avoid back surgery. Being board certified in both pain management and anesthesia, our team can ensure you are comfortable throughout your entire procedure. You may be a candidate to receive a nerve block, steroid injection, facet joint injection, or one of several other procedures that can relieve your back pain while helping you avoid surgery! These interventional pain management procedures can also help your doctor make a more accurate diagnosis. If your pain improves from one of these procedures — even for a short period of time — it helps your surgeon to better pinpoint the cause of your pain. Not all spine surgeries are created equal. Some surgeries can have high success rates, but only in well-selected patients. For instance, microdiscectomy and laminectomies have a high success rate in people with herniated discs and spinal stenosis, respectively. Spinal fusion surgeries are effective for relieving pain in patients with multiple conditions and instability of the spine. You should always ask your spine surgeon about what type of surgery you need and its success rate for your condition. Smoking negatively affects your body’s ability to heal. You’ll have better results from surgery if you stop smoking. If you continue to smoke, then your surgery may not be as effective at relieving pain, especially if you’re undergoing a spinal fusion. Can you participate in physical therapy? Some spine surgeries require physical therapy for weeks or months after the procedure. Your surgery results will be better if you can participate in physical therapy either at home, or at an outpatient office. If you don’t feel that you can stick to physical therapy recommendations, then the outcome of your surgery may be less effective. Physical therapy benefits after your surgery should always be discussed with your surgeon. You’ll have fewer surgery-related risks if you are an otherwise healthy person. Some conditions like heart disease or diabetes can put you at higher risk of surgical complications. Other health conditions, like obesity, may also reduce your surgery’s effectiveness. Before your procedure, your surgeon should talk to you about how your current health may affect your surgery so you can make an educated decision about your treatment. Do you trust your surgeon? You should always ask your surgeon about the possible risks and benefits of your surgery. You should also ask them about their experience with the surgery and how many procedures they have performed. You should always talk to your surgeon about what success means to you and ask them if a certain procedure will achieve it. For most people, “success” means relief of their pain and functional improvement. Your surgeon should be your trusted guide to making this decision, and that’s why Dr. Siddiqui takes such a careful approach to each patient’s care. Thanks to his years of experience and advanced spine care training, he has excellent surgical judgment and can help you determine if you are a good candidate for surgery. Still unsure if spine surgery is right for you? Call The Spine Care Center in Manassas at (703) 257-2266 or request an appointment online to speak to one of our spinal experts. We look forward to speaking with you soon!